It’s a scruffy, dusty old barn, but here we can finally display the collection, and use it to try to raise interest and funding for a permanent home, where all that history can continue to be available when I am gone. Here are some views of our collection and as you can probably see, there is a little bit of work still to be done over the next few months, including electric lights, We are on our fifth electrician, but this one actually turned up! Although it’s a work in progress, small numbers of people can visit by appointment, there is very little display material yet. It’s a private collection, not “open” to the public, but at least it is pigeon-proof now! The world has gone through a long period where history was destroyed without any thought, and where value has been all about money. As a result, we don’t know of any other museum anywhere in the world that has over 50 actual pianos ranging from the 1790s to the 1970s – Georgian to modern. 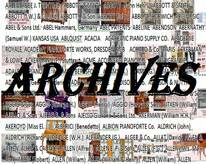 Having achieved that first layer in building our time-line, the next major task is to wade through fifty thousand images and cut them down to three thousand of the best for our “wonder wall” of piano history. Several companies have attempted to sum up the evolution of the piano in a single poster, but my version of this idea aims to have over eighty four-foot squares of pictures and information. If a picture paints a thousand words, we could have 3,000,000 words around the walls. The next task is some restoration work on the pianos, many of them have been in store for years, but it is in areas like display costs that your donations are so vital. Imagine a piano standing up against a wall: printing pictures on the wall above it to a professional standard costs more than the piano is worth. Small monthly donations can also be set up through the Donate button, and piano firms can place an ad here for £5 per month. To print three thousand pictures to a professional standard will cost thousands of pounds. In a way, the pianos are only window dressing, the main collection is history. Nobody anywhere can guess the value or condition of a piano without inspecting it on the spot, and checking how well it holds in tune, so your local tuner is the best person to ask about that. Here in Britain, where antique pianos are plentiful, unrestored ones have very little value, and we are offered several each year for nothing. The most important factor deciding the value of a piano is not its name, but its condition, and the most important aspect of that is whether it holds in tune, because if it doesn't, repairs can cost over a thousand pounds, and this is usually more than an old piano is worth. 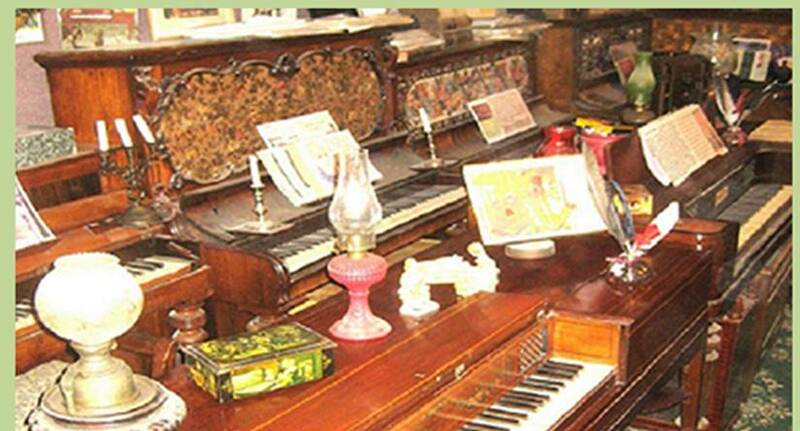 Piano dealers don’t normally deal with antiques, and antiques dealers don’t usually know much about pianos. 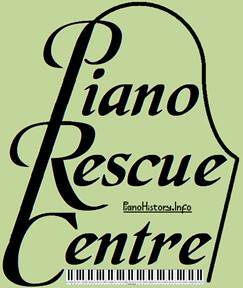 PIANO TUNING in Lincolnshire & East Anglia, including Norfolk, Suffolk, Essex. 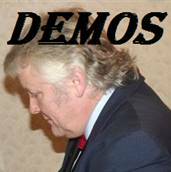 DEMOS of Bill Kibby’s performances on various instruments. 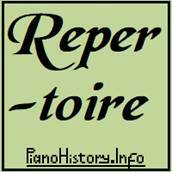 REPERTOIRE – over two thousand titles that Bill Kibby can play for you. ARCHIVES of the piano makers are rarely available, so we try to fill some of the gaps. 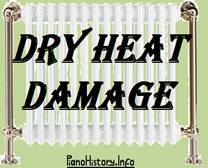 CENTRAL HEATING can damage your piano. 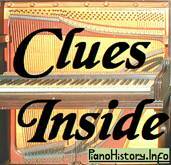 DATE-MARKS and other clues inside your piano. 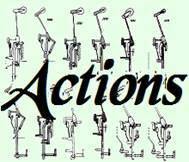 DIAGRAMS of piano actions – the working parts of the notes. 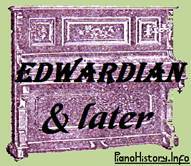 EDWARDIAN upright pianos, and later ones. EXHIBITION medals and awards shown on a piano provide clues to its age. FALSENESS in piano strings can make tuning very difficult. 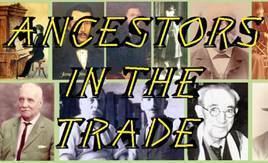 GENEALOGY of piano makers, and some impression of what your ancestors might have done in the piano trade. 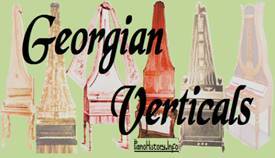 GEORGIAN vertical pianos and earlier attempts at upright pianos. 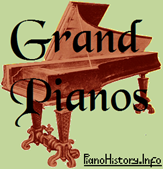 GRAND pianos from Cristofori’s invention through to modern. NAMES and aliases used on pianos. 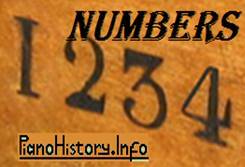 NUMBERS are not always a reliable guide to the date of a piano. SQUARE pianos (Querpianos) were the main domestic instruments before upright pianos were perfected. HEALTH matters and possible help with them. 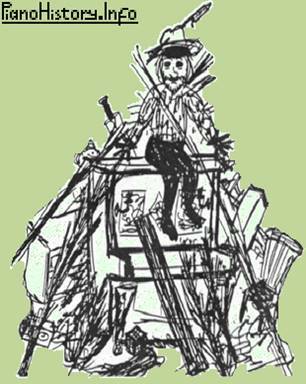 BILL’s BLOG has little or nothing to do with pianos or music. MEMORIES of my childhood in Walthamstow. Imagine a museum of piano history, with the world’s largest specialist archive of related information, a unique pictorial time-line of piano history, thousands of images, thousands of index cards, thousands of printed pages, a collection of Victorian books containing piano ads, irreplaceable reference material, as well as actual pianos from the eighteenth century right through to modern. Although the books were purchased for their piano content, they also provide a wide range of general history. Now imagine taking the world’s largest collection of piano history, and packing it away into a large brick shed. We had all the ingredients, but sadly, our humble building at Yarmouth was barely big enough to store our unique and growing collection, let alone display it, so for years, the pianos have been crammed in together, and the archives were functional but not on display. At one time, the only way into the room was to climb on a stool, then up onto a piano, crawl along it, then along another one, and down onto a stool! I have spent my life achieving lots of things that people said were impossible, some of them are listed on this website, but for ten years, the big challenge was to find a way into a permanent home for this unique and irreplaceable collection, before I get too old to do it justice. General (non-piano) History items are further down the page. We are a world centre for piano history, we deal with enquiries from around the world every day, and I find myself in the position of being the keeper and protector of a unique history collection, not just because it is my passion, or because of anything it can do for me. It deserves to survive long after I am forgotten, because people need it. Visiting pianos at many museums, it is interesting that there is usually little or no historical information attached to them, whereas we have more than we can possibly display. Recently, we supplied a dozen items to a World War I display, and a friend was immensely impressed with what was, after all, a tiny fraction of our display material. We also offer occasional lectures on piano history to Women’s Institutes, colleges, museums, schools, etc., and I am always impressed by the enthusiasm of so many people who want to learn more about pianos, and ask very searching questions. One by one, they all fell by the wayside and ceased to exist, but we are still here! In 2007, we moved to Great Yarmouth when we were offered a large museum space in a wonderful Georgian setting, but sadly, after months of intensive preparatory work, the premises proved to be unsuitable because of problems with parking, disabled access and egress, fire regulations, legal wranglings, and differences of opinion between the residents and the local council about many things, including the previously-stipulated ground floor space, which was a matter of public record. Not only that, we were asked to put my most treasured possessions (and my life’s work) into a building where anyone could walk in when we weren’t there! What seemed like a gift from heaven to house our collection for a peppercorn rent ended up with the council wanting us to invest thousands of pounds for an upstairs venue that had not been designed to fit in with modern regulations. Ironically, it was only in the process of designing displays for that museum that I really began to appreciate the scope of what we have here. People often say that we will need a lot of space to display forty pianos and organs, but what they don’t realise is that in order to display the more important history items at a reasonable size, we need even more display width. To add to our problems, Yarmouth is a flood risk area, and although we said “it hasn’t flooded since 1953”, within a few months of moving in, we had a near miss when we were evacuated because of flooding just along the road. I had the image in my mind of all the pianos floating down the river! We were not troubled by flood waters, but greatly troubled by the repeated flood warnings, which had us in a panic to get irreplaceable books and paperwork into the house, and upstairs. In the process, electronics got broken, the books were thrown into chaos, I strained my back, and we were exhausted. We couldn’t keep doing that. 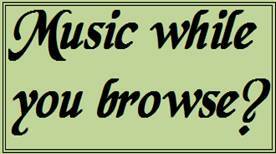 I began collecting musical instrument information around 1958, and focussed on pianos from 1963. When I left college in 1965, I realised that there were many unanswered questions about piano history, and as I began seeking them, people were already asking me for help. 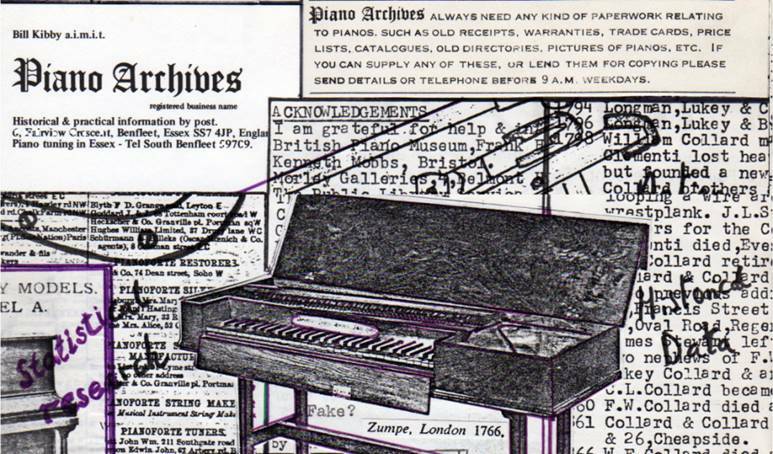 My Piano Archives service was dealing with historical enquires by 1972, when home computers didn’t exist, and everything was done with a pen, a typewriter and a photocopier. By 1989, I had a shop in Lowestoft, and was writing computer software that could search through the files overnight, and print out the results while I slept. Things are a teeny bit quicker with modern computers, but less convenient for writing one’s own software. 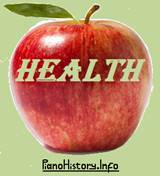 In 1990, I began 14 years of major illness, and was given no help at all by the NHS. I was incapable of going out to work, and while my current life was showing no progress, I tried to invest in my future by working on piano history whenever I had a burst of energy. That intermittent work laid the foundation for the service we now provide every day, read by thousands of people all around the world. Since 2001, I have dealt with thousands of postings on the piano history forum, in addition to our own extensive clientele, and thousands of people around the world look at this website every day. Last time I checked, there were nearly seven thousand hits per day. The hits for my forum postings about Spencer pianos alone are in excess of twenty thousand. 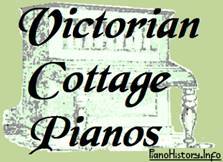 Our active research is aimed at antique British pianos. The majority of those were manufactured in London. The majority of their factories were in the Camden Town and St.Pancras areas. Many piano books are written by professional writers who have no experience of pianos, or only have a very narrow view of the subject. On the internet, text is often misleading, and you will find a lot more reliable material from Google Images, but unfortunately, huge amounts of space on the net are wasted on images that are not labelled properly, so part of my work is in cataloguing and cross-referencing these. Just for fun, try searching for paino or panio. A lot of the misinformation about piano history has arisen from people writing books and phrasing things badly, or misquoting information, or quoting other authors without realising that they had got it wrong. I have written to authors, challenging statements they made, and the usual answer is that they read it somewhere else, and took it to be correct. Sometimes, there is a whole chain of people quoting previous authors, and this applies especially to serial number dates. Nobody is immune to misinformation, and the tangled web often makes matters worse by spreading misinformation more rapidly so, as they often say in CSI or NCIS, “follow the evidence”. I spend a lot of my time searching for original unadulterated information from paperwork, or the pianos themselves, but even that will have human errors. It might seem that by looking at books written a century ago, we would get nearer to the original truth, but this is not always the case, they didn’t have the benefit of later research, and people like Michel, Dolge and Brinsmead published all kinds of misinformation, commenting on aspects they knew very little about, or carefully quoting misinformation from each other. · A range of Victorian books from 1844 onwards. 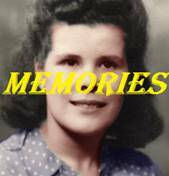 See our Books page. · The world’s largest directory of past British piano firms. If you wanted to look up a local piano firm you might look in your local Yellow Pages. 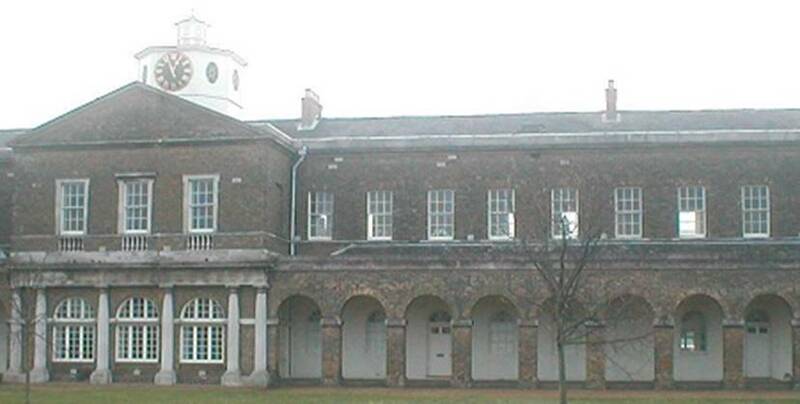 Our lists cover not only most of the towns, but most periods going right back to the 1700s. Without donations, I will be fine, but our collection may not survive. If every visitor to this site made a donation, we would be able to add more displays to our museum building, and improve facilities for research within our own archives.